**Updated April 2, 2016 - Season & Pass Sale EXTENDED to April 17, 2016! Snowbasin, UT (March 19, 2016) – Snowbasin Resort is offering free skiing and snowboarding through the remainder of the 2015-16 winter season with the purchase of any 2016-17 season pass. Passes are now available to purchase at snowbasin.com. By purchasing next year’s season pass this spring, Snowbasin Resort skiers and snowboarders lock in the best rates. Adult 2016-17 season passes start at only $489 and the lowest available pricing is valid through April 17, 2016. Snowbasin Resort currently offers the 2016-17 Premier Season Pass for Adults (ages 27-64) for $689; Young Adults (ages 19-26) for $459; Teens (ages 13-18) for $279; Youth (ages 7-12) for $189 and Seniors (ages 65-74) for $489. The 2016-17 Premier Season Pass is available for active and retired military members for $469. All 2016-17 Premier Season Passes offer unlimited skiing and snowboarding with no blackout dates. Additional passholders perks include 44 days of skiing/snowboarding at 14 other ski resorts, 2016 Summer gondola access and more. Adult Value Passes are also available for 2016-17 for $489 as well as a Midweek Pass for $419 and only have 11 blackout dates. The 2016-17 Super Senior Value Pass (ages 75+) is on sale for $49 and the Child Value Pass (ages 6 and under) is $10. 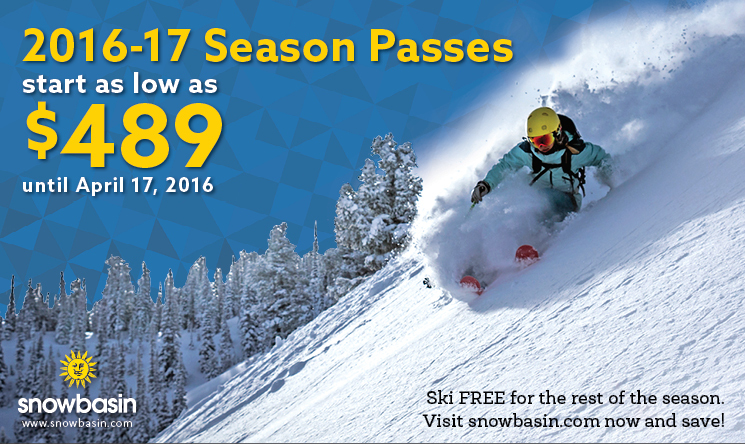 For a complete listing of 2016-17 Season Passes and their perks, visit Snowbasin.com/season-passes.